Going to Monreale, seeing the cathedral and the cloister a second time did not take away from the beauty of each site. I especially loved seeing the cloister again. Each pillar surrounding the center of the cloister had different mosaic patterns made up of different shapes and colors and every one of them was breathtaking. Another fun thing that I didn’t notice until this time around was how many lizards lived in the cloister. We all started seeing how many different colored ones we could find. The picture shows a few of my italian classmates in the search for some lizards. 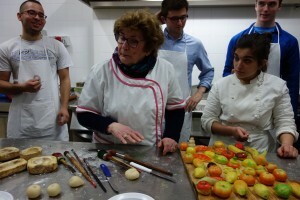 That night in Erice, we met Maria Grammatico, who learned how to make marzipan when she lived in a convent, taught us how to make various desserts with grounded almonds. They were SO yummy and we ended up eating leftover marzipan for the rest of the trip. Maria was so kind and she and the rest of the people at the pasticceria made us the most amazing dinner!